After 5 years of really slapdash blogging, it's easy to forget that you came up with some pretty neat blog post concepts. 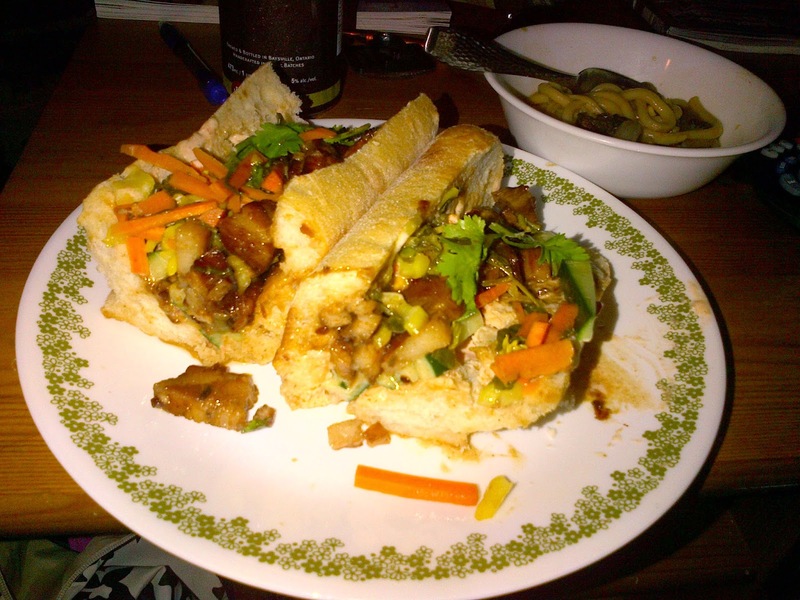 I was all kinds of crazy-excited about blogging about Char Siu pork and turning leftovers into Banh Mi (a delicious, decadent Vietnamese variation on the submarine sandwich) and totally forgot about the fact that I've already done a series of posts on epic sammichery! So hey, let's bring it back from the dead! So where to begin? Well, let's give a little backgrounder on the Banh Mi. Essentially, Banh Mi is the Vietnamese word for bread, but since bread in Vietnam was a colonial "gift" from the French, but the name is usually linked to these sandwiches that are a fusion of Vietnamese and French flavours and ingredients. The archetypal Banh Mi is a baguette sliced in half, slathered with paté and mayo, topped with carrots, daikon (usually pickled), cilantro and a bit of fish sauce (and hot peppers for good measure if you're brave enough) and filled with some sort of meat or eggs or even tofu. It isn't exactly diet food, but if you're lucky enough to have a local Banh Mi shop, it's an awesome meal to try, AND usually cheap. Bow down to epic sammichery! Now, this particular Banh Mi experiment came about as a result of leftovers from the night before. I had decided I wanted to try making the famous Chinese Char Siu-style pork using pork belly. If you've ever had a BBQ pork bun from a Chinese bakery, you'll know the deliciousness of which I speak. Now I don't really know if it's commonly smoked (I think it's usually baked or, possibly, "red cooked"), but I knew that's how I wanted to cook it (I mean, come on, I'd smoke ice cream if I could...). But the key isn't the way it's cooked, it's the way it's marinated/coated. From what I've read and what I've eaten, Char Siu should pop with sweetness and saltiness and have strong accents of hoisin, anise and Shaoxing cooking wine, all of this achieved by marinating the meat for a good while (and then coating it in a very similar glaze/sauce). Now, slow-smoking it imparts the additional layer of smokey BBQ goodness (especially if you add a rub), so why would I not? I did some searching through Internetland and basically found a recipe here that was very similar to what I was going to do anyway, but I added some tweaks. So, let's start with cooking the meat portion of the Banh Mi! - Stir all ingredients together and apply liberally over meat, massage rub into meat. - If omitting marinade, place meat in the fridge for 4-24 hours. NOTE: In this case, the marinade portion is somewhat optional. First off, it's pork belly, so marinating isn't required to impart moisture, there's more than enough fat to do that. Second, you will be brushing delicious sauce on the meat no matter what, both during the smoking process and right before serving, so the signature Char Siu flavours will still be there. In my case, I'm pretty sure I did not marinate the meat since I'd used a rub (if my spotty memory serves me right), but in the future I think I'll go whole hog and use both (pun absolutely intended). But either way, the marinade is also the basis of the sauce that is later used to coat the meat before serving. - Mix all ingredients together with a whisk or fork. - Place pork belly in large zipper bag and pour in half of marinade. Reserve rest of marinade and refrigerate. - Shake bag to coat meat and place in the fridge for at least 2 hours (24 is better). - To prepare the meat, remove from fridge and zipper bag. - Start a fire in your smoker. As always, I use lump maple charcoal. Soak two big handfuls of wood chips in water. I used cherry wood chips in this recipe as they seemed a natural pairing to the sweetness in the marinade from hoisin and honey. - Once fire is going at 225-250, place meat in the smoker and smoke for 4 hours. Add small handfuls of wood chips every 30 minutes or so to produce additional smoke. Baste the meat every hour or so with some of the reserved marinade. - About an hour before serving meat, place rest of marinade/sauce in a pot and heat at medium heat and reduce until thick. You might need to add extra wine to prevent it from getting too thick. Keep warm on low heat. - Remove meat and let rest for 15-20 minutes. - Cut pork into 1/2 cm thick slices and brush all pieces with sauce until well-coated. Originally, this meat was part of a noodle dish, but we were too full to eat all the Char Siu, so it became part of awesome leftover sandwich goodness. To assemble the Banh Mi, Slather paté and mayo on the bread. Traditional Banh Mi use paté and mayo, but I just used mayo in mine (mixed with a squeeze of sriracha and lime juice). Arrange slices of pork on half a sliced baguette. Top with julienned cucumber, pickled carrots, ginger and radishes (here's how to quickly pickle stuff) and chopped cilantro. The flavours are so good! Sweet and licorice-y and salty and fresh from the veggies. And there you go! Sandwich goodness of good!